I feel the graphic of expansion makes this question seem obvious. Why does MOMA see the only option for expansion as horizontal? This is Manhattan – the sky is the limit. 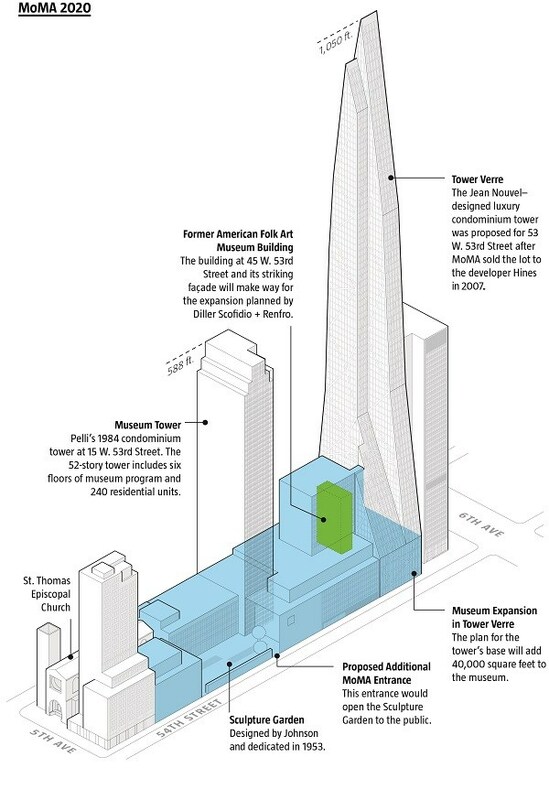 There could also be other architectural options to deal with the Folk Art Museum location in the middle of the expansion site. Looking at the museum and merely saying it’s in the way, we must mow it down, is a weak argument. Similar situations have been dealt with in other projects. 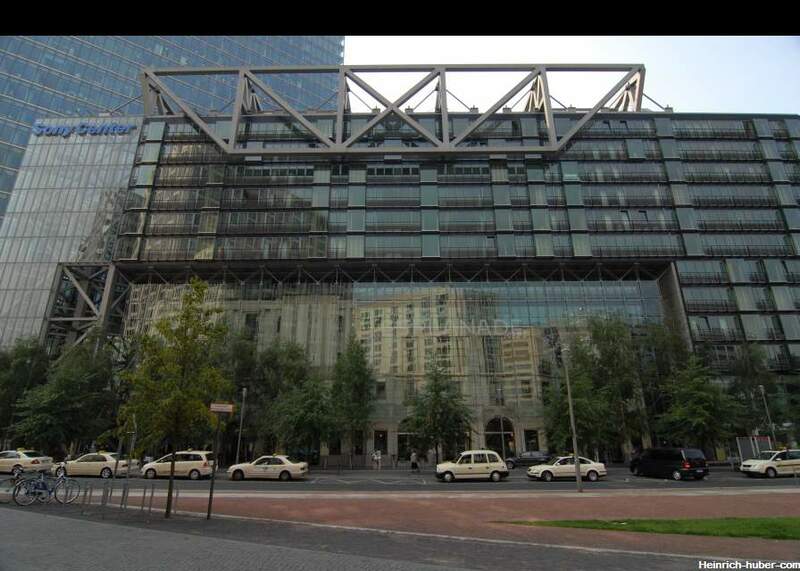 The one that comes to mind is the Sony Center at Potzdamer Platz and the Hotel Esplanade. The Sony Center was built over and around the hotel and incorporated it into the design. A more sensitive design could have been accomplished if MOMA actually looked within it’s walls and tried to draw some inspiration and exemplify some of the vision and thoughtfulness of the works it contains. I think that this also demonstrates MoMA’s shift from an institution that provides a public, cultural benefit to that of a “brand.” MoMA and its ever growing gift shop, planned residential development, and – as you described – imperialistic horizontal rather than vertical expansion seems to indicate that MoMA believes it can be more successful as a lifestyle rather than a leader in art. 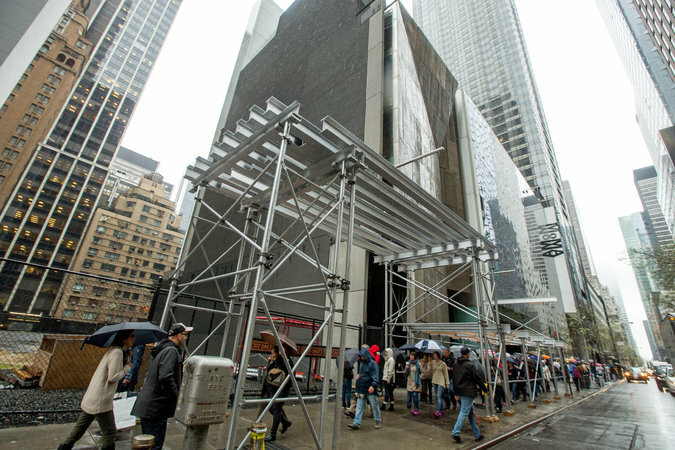 While other institutions like the Whitney are building new spaces in order to better hold and expand their collection, anchoring their buildings through public accessibility, it is disappointing that MoMA’s objectives are more brand than patron focused.